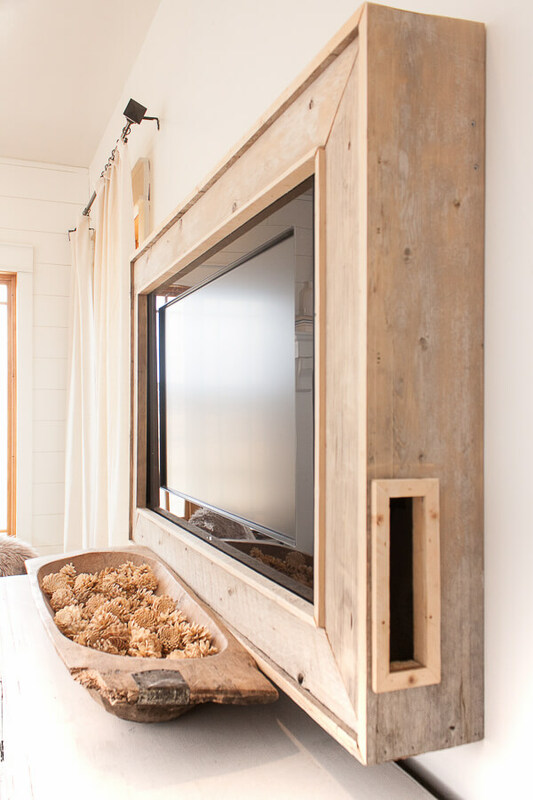 Want to hide that ugly television? 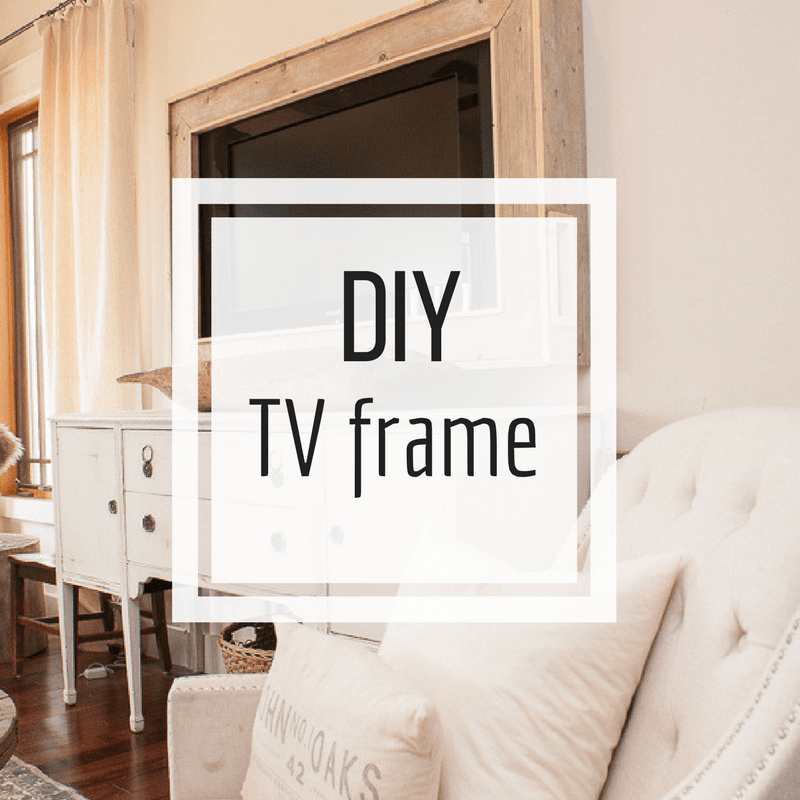 Make your own TV frame with this simple DIY tutorial and create a stylish look for your home. 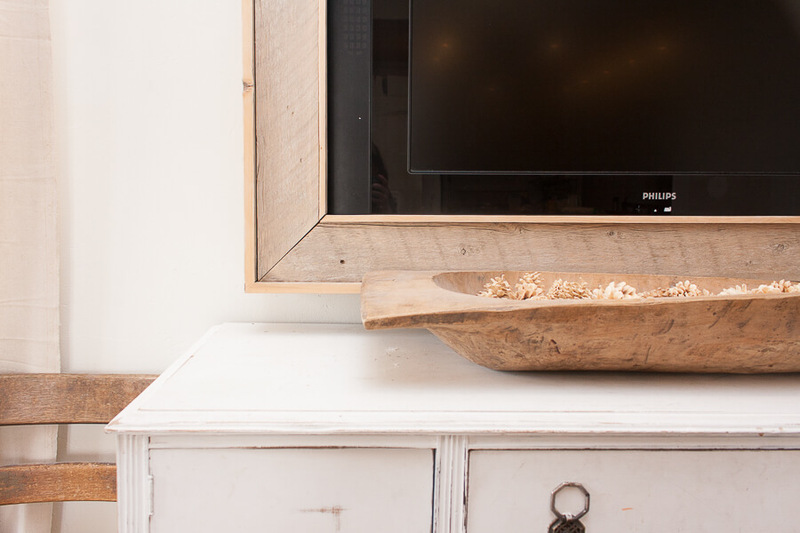 I cannot count how many times I have been asked about my TV frame that we built for our television downstairs. 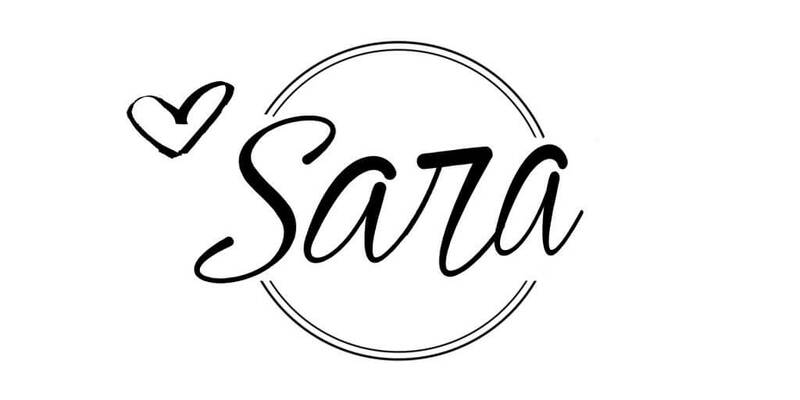 And, this weekend I was finally able to get a break down of how we did it, and I will tell you it was actually a very quick project! 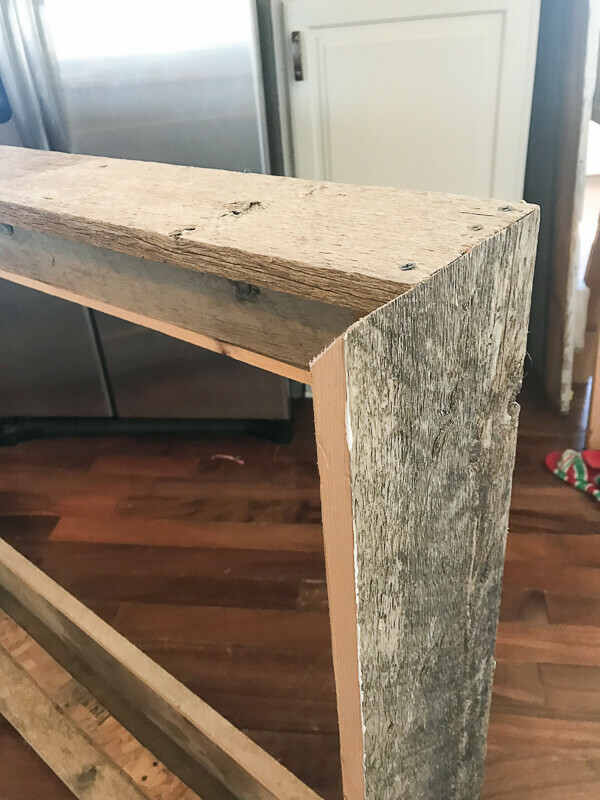 About two years ago, I asked my husband to help me create a TV frame for our television in our family room on our main floor. Now, I wasn’t really a fan of having a television in that space, mainly because TVs are just not pretty. 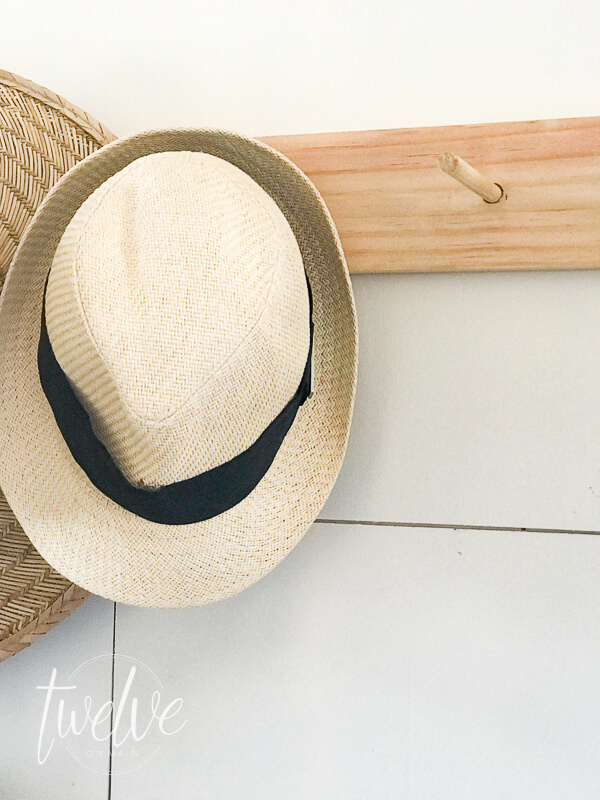 and as a DIY and home decor blogger, it is my duty to find a way to make it beautiful and still functional. I mean, as much as I don’t want a TV in my family room, I can’t help but want to watch my guilty pleasure while making dinner. I am human after all. 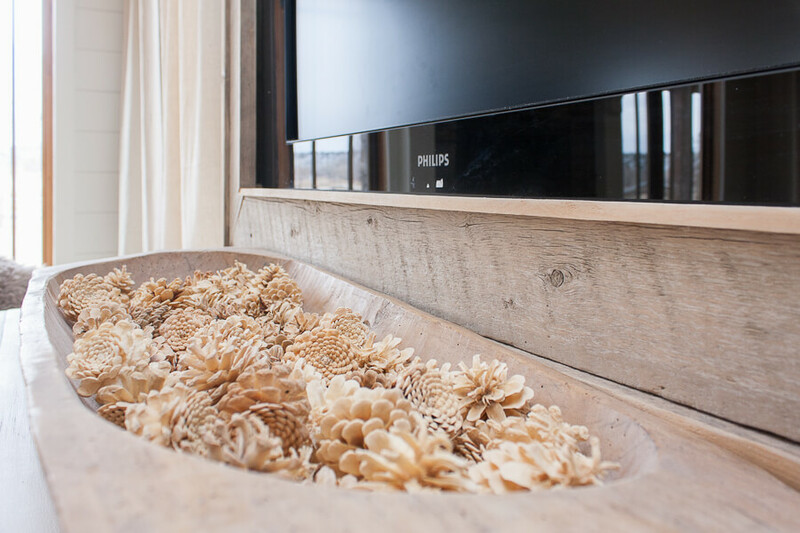 So, we were on a mission to create something awesome to conceal that ugly television. What we ended up using was some 1 by 8 weathered boards that we had been given by a friend. They had been sitting out in the weather for about 2 years and had just the right amount of age and distress to them to fit the bill for our TV frame. Now, the television that we were going to frame is not the newest nor the fanciest, and it has these weird speakers on the sides of the TV that we could not cover up. We had to take that into consideration when building our TV frame. We also wanted to address the issue of letting the television breath and have some air circulation so that it did not get dangerously hot! We took that into consideration too, and I will show you what we did to address these issues. The first thing you want to do is to measure out your TV and decide how and what you want this TV frame to cover. 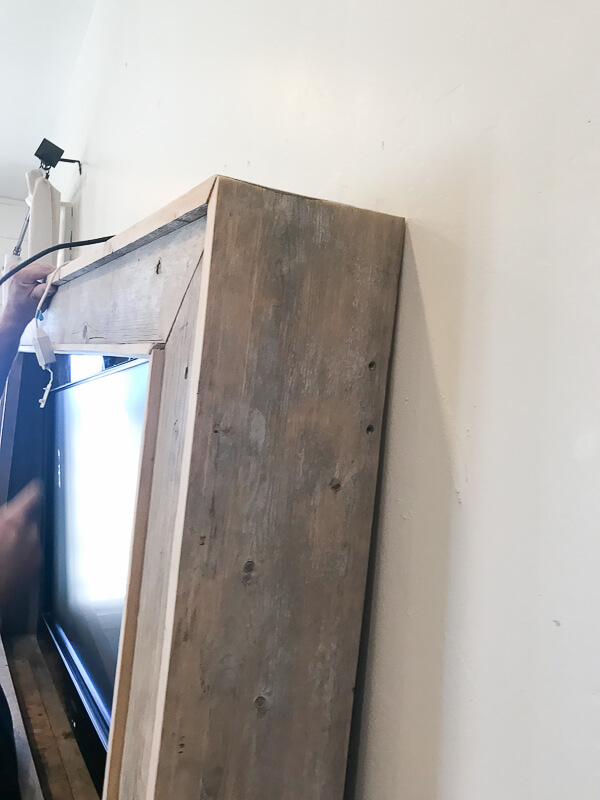 Since we had kind of a weird television we wanted to make sure we didn’t cover up those lovely speakers, but we wanted the frame to cover the edge of the television and mainly show the screen. So we measured the length and the width of the TV. We then took one inch off of each side so that in the end the frame will slightly overlap the TV and hide the edge of it. 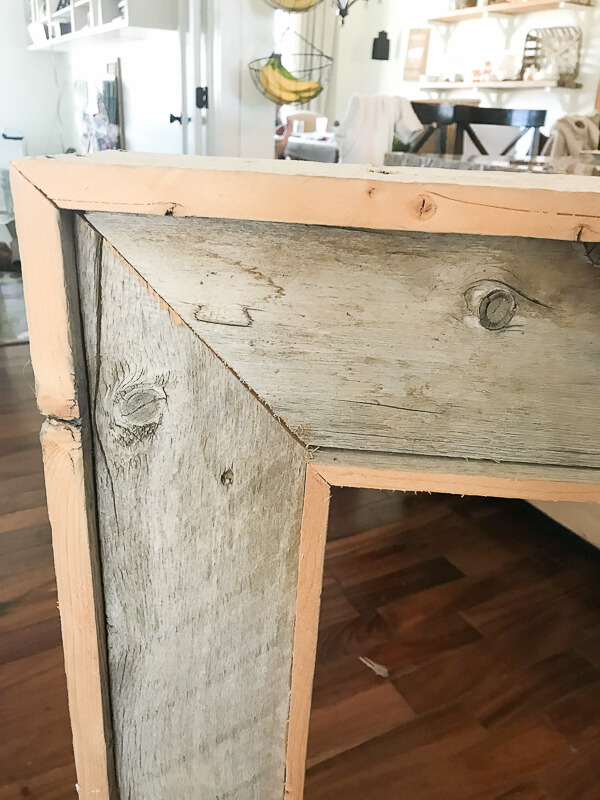 Now, our TV frame has a few details such as an overlap on the edges to create a trim effect on the outside of the TV frame and then we added a small detail trim on the inside. So, I am going to give a tutorial on how we did ours. If you want to change yours up a bit, totally feel free to do that! This allows for a lot of freedom in your design. We started by cutting the front pieces. These are the pieces that you can see straight on when the TV frame is hung on the wall. Take the measurement of your TV that you took at the beginning. 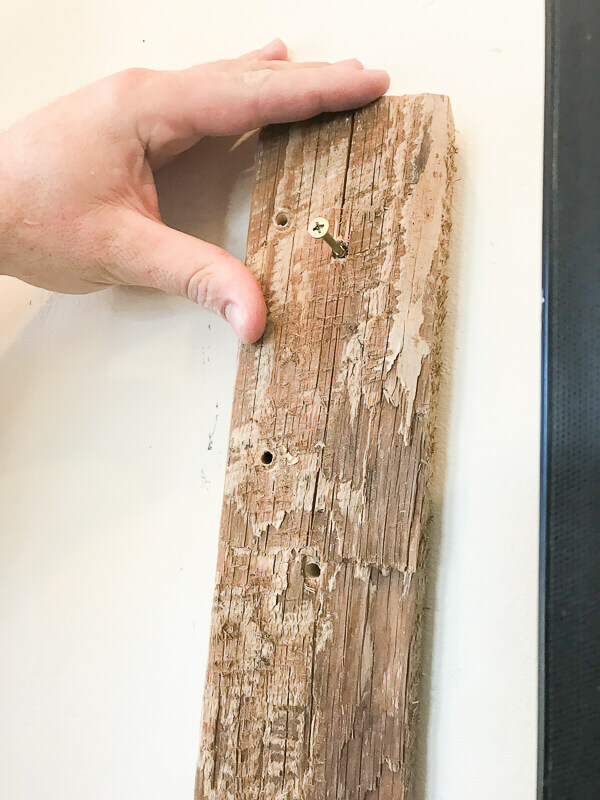 You want to have the inside cut of the wood to be 1 inch smaller that the length of your TV. This will allow the frame to overlap the TV just enough to cover the edges of the TV. If you want the frame to cover more, you can adjust how much shorter you cut the front pieces. 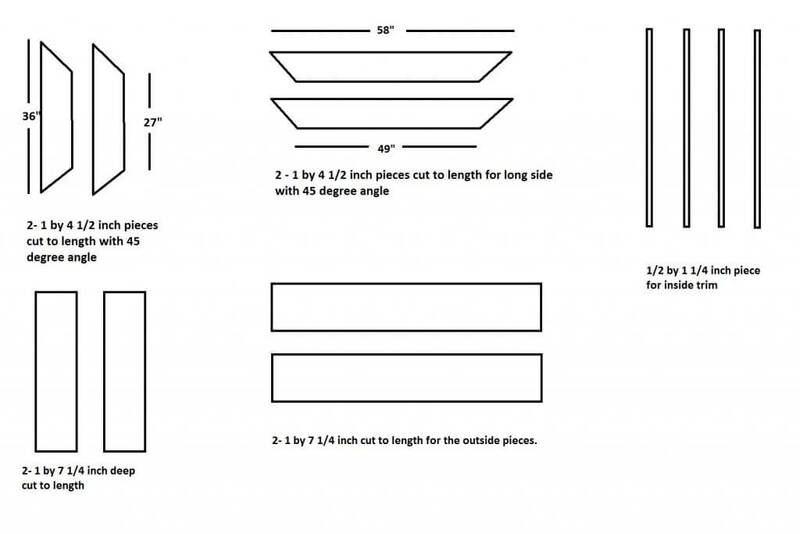 Here is a layout of the pieces we needed to create our TV frame. We took the 4 pieces that were cut at 45 degrees and assembled them into a frame. Along the back, we added blocks to connect the corners. You can use metal brackets if you want. 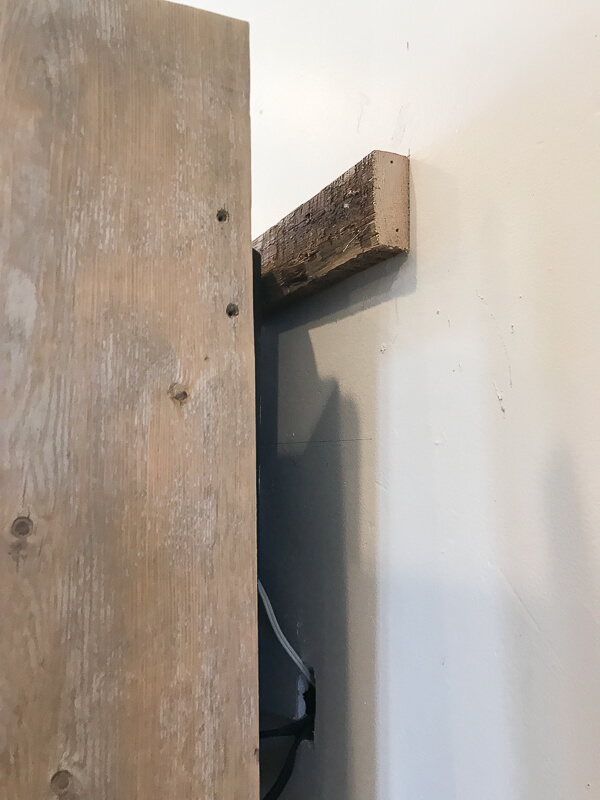 We ended up using wood because this was a late night project that we started on a whim and didn’t have any metal brackets. The wood blocks have worked perfectly, and it has been a few years. The outside pieces will have the same 45 degree angle on them as well. We took the top piece and cut it 1 INCH less in depth that the other 3, so it would by 6 1/2 inches deep. This gives the frame a place to breath so that the TV does not get too hot inside. We used or nail gun to nail this together. This is where is comes in handy to have a second person to help. You can either assemble the outside pieces first and then fit the front piece into that, assemble the outside pieces directly onto the front frame. For this you will need someone to help hold the outside piece while you nail them together. This is what we did. We overlapped the top pieces one inch over the front piece to create a trim effect. 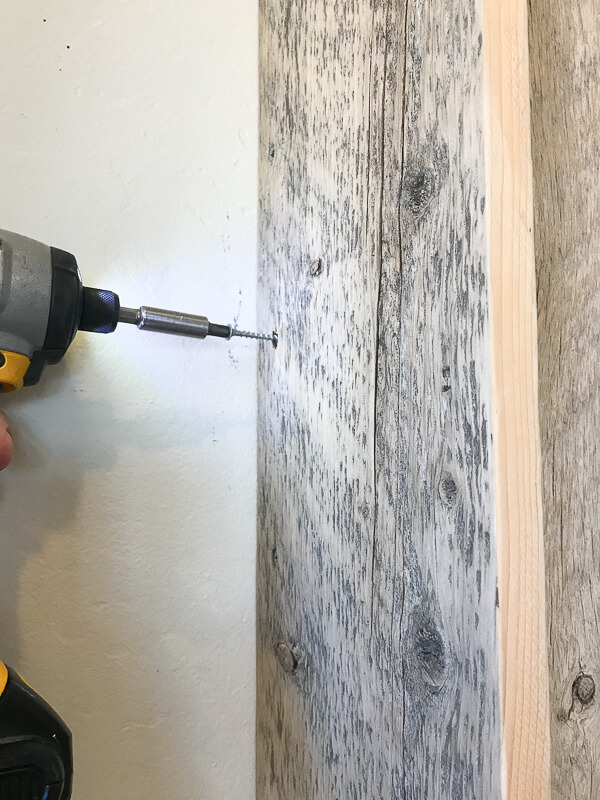 We used our brad nailer to nail the pieces into place. Remember, the top piece will have a 1 inch gap at the top for ventilation. One other item we took into consideration was being able to access the buttons on the TV. 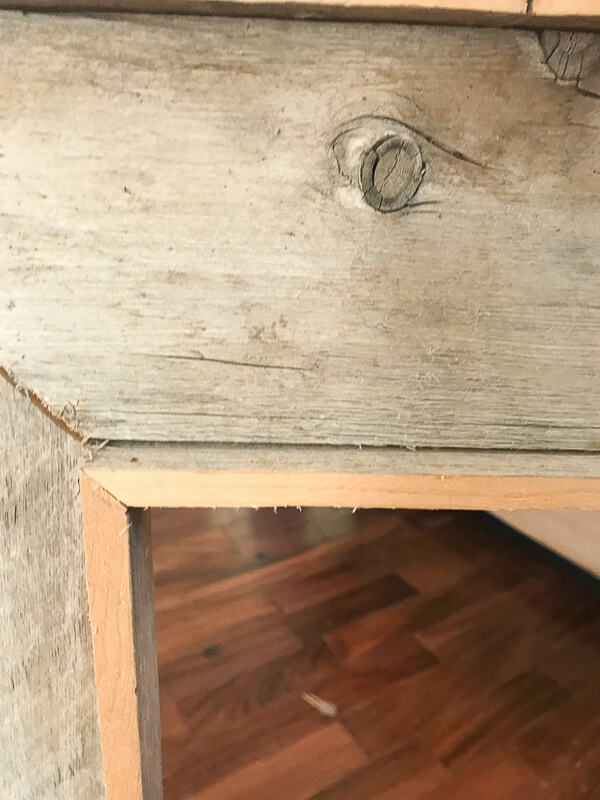 We decided to cut a small 9 by 2 1/2 inch opening in the side of the frame where the buttons on the TV are. This way we had accessibility to the TV in case we lost the remote. At this point you will have the piece almost completely assembled. We added a small 1/2 inch by 1 1/4 inch piece of trim to the inside of the front piece. We overlapped this as well, so that it would coordinate with the outside trim. Since we used weathered wood, the outside had a grey weathered look but the inside was still nice and tan. I loved the way they looked together and kept them as is. I just gave it all a good sanding to take and rough spots off that would make it difficult to clean or dust. This proved to be easier than I thought it would be! 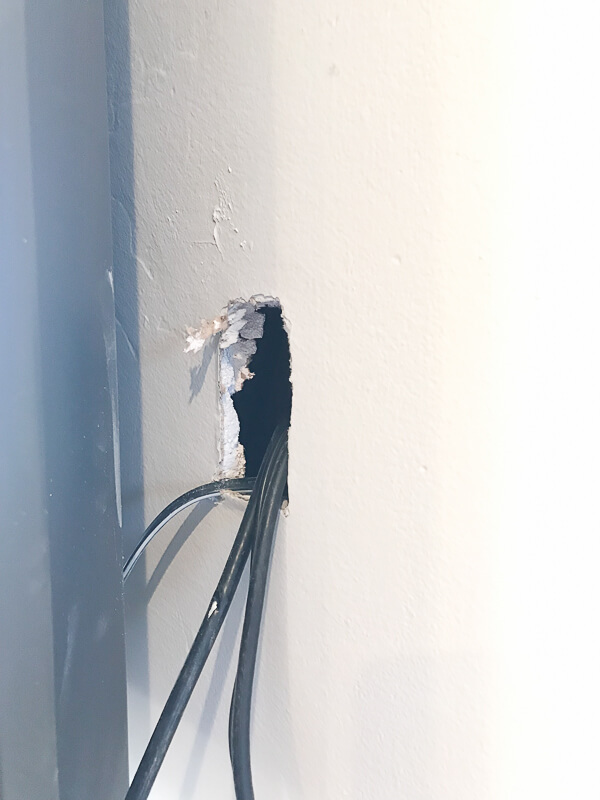 First, we made sure to hide our cords, by drilling a small hold into the wall behind or just below the TV. We then fed the cords through the hold and down to the outlet. We installed an outlet behind the cabinet so that you would not see them. Next, you want to make sure your TV frame fits your TV, so dry fit it onto it. Draw a line along both sides while it is still on the TV. Now you can take the frame off and secure some blocks to the wall. 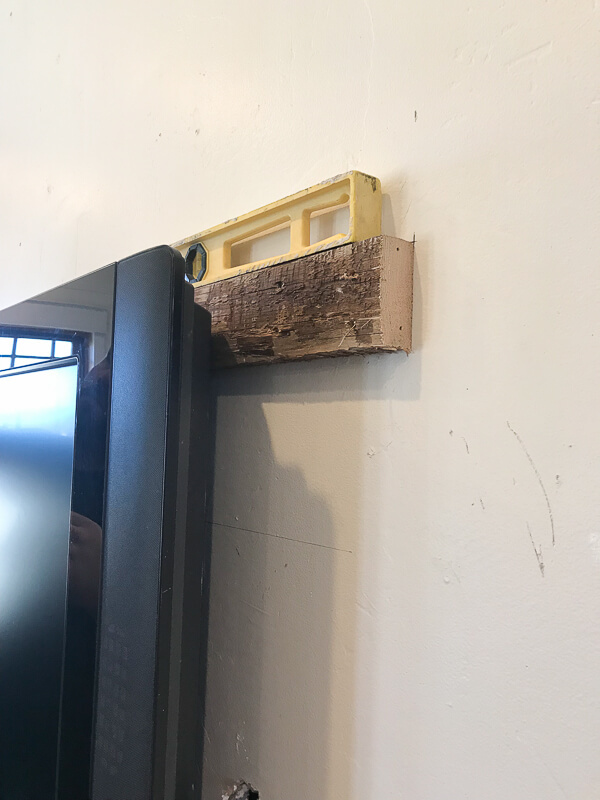 You want to use a level to make sure that the TV frame is level. When you take the frame off the TV you will have some lines drawn on the wall. You want to measure one inch in from that line and this will be where your blocks will be installed. We installed one at the top of the television and one on the side.. You can install them on either sides. Its up to you. We did this so that we were sure to hit a stud at the top. The block on the side needed drywall anchors since there was not stud. We used our stud finder to check for this. 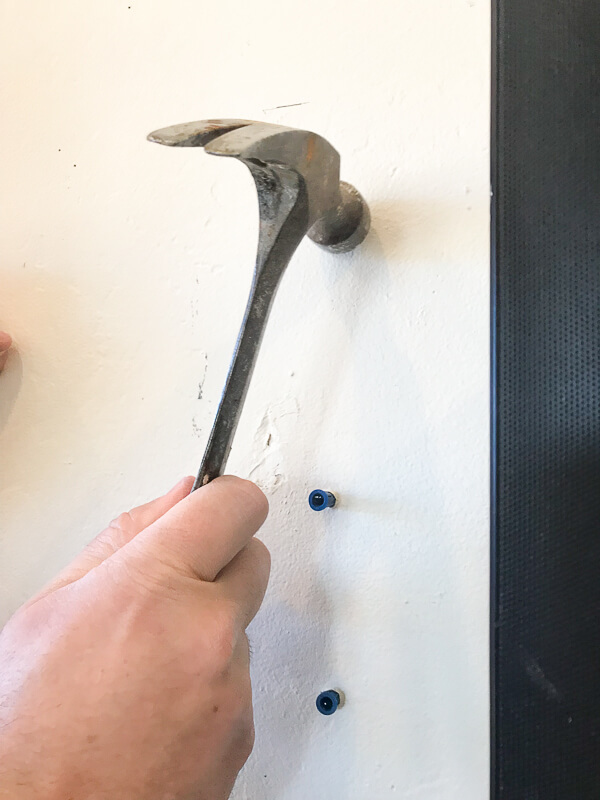 Once the blocks were secured to the wall, we put the frame back on the TV, and checked to make sure everything was in place and level. 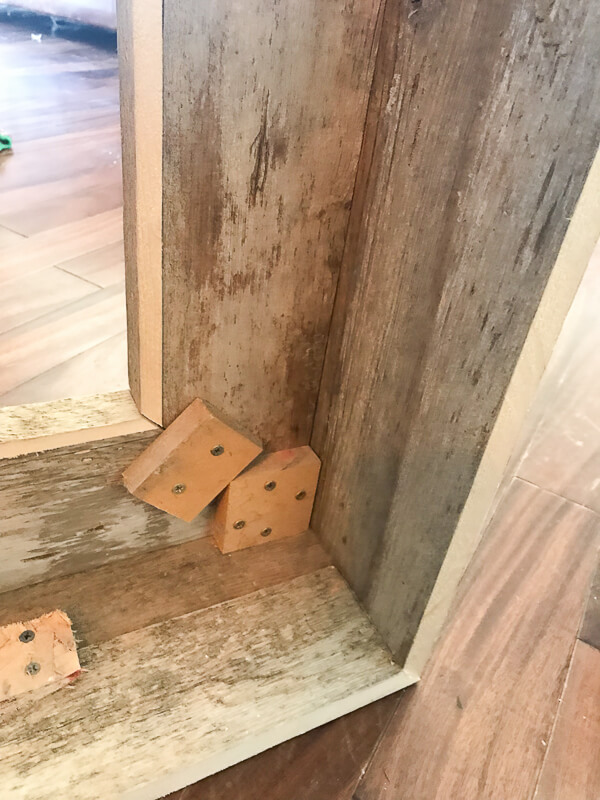 We then screwed in through the outside of the frame into the block on the inside. It is wise to do one side, check for level and then screw the other side in. Once they are secured to the blocks you are done! 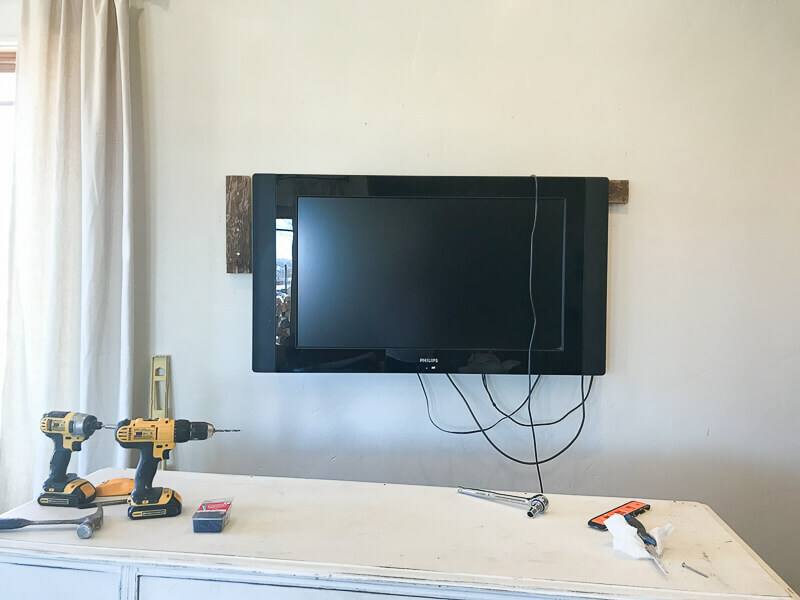 You now have a TV frame to conceal the not so pretty parts of the television. 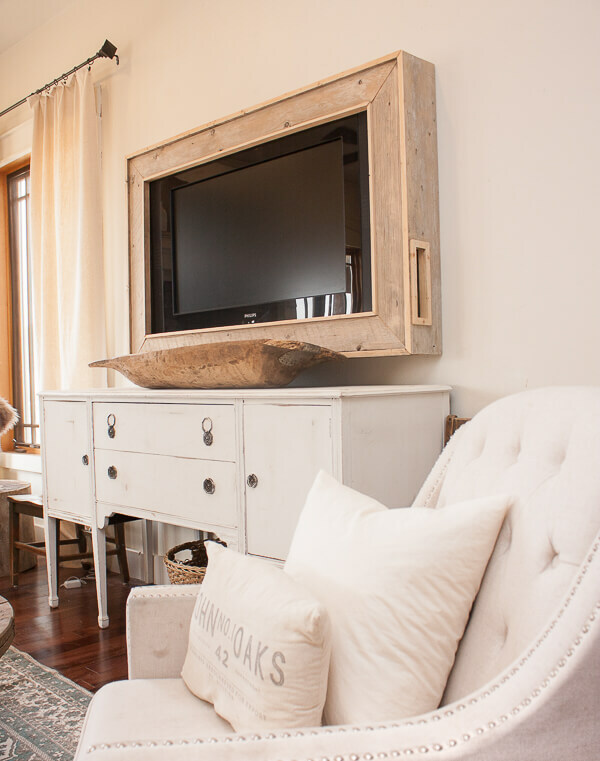 The TV frame finishes off the television and adds substantial style and decor to the space. 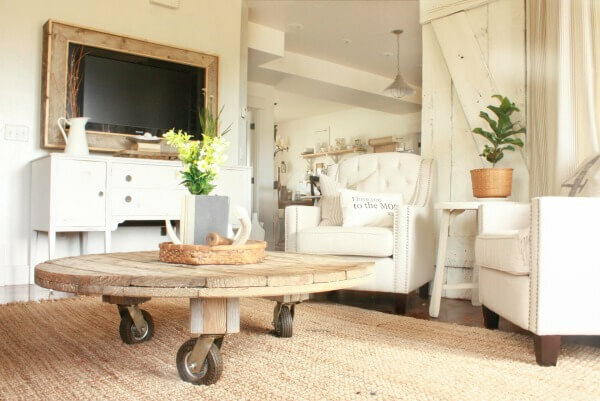 The weathered wood we used created just the right amount of texture and interest to my living room. Watching TV is so much more enjoyable when its pretty! 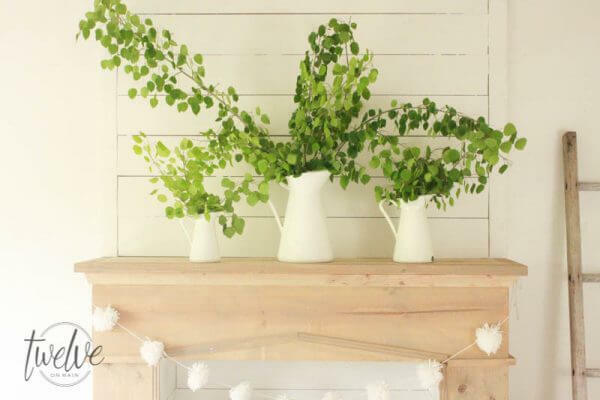 Now, I am off to finish decorating the rest of my family room for spring! This dull weather has me craving some bright and fresh elements. I hope you will try out this tutorial to make your own TV frame. They can be customized in so many ways that you can create one to fit your space perfectly. If there is anything you loved about this room, I have rounded up some similar items to create this look! 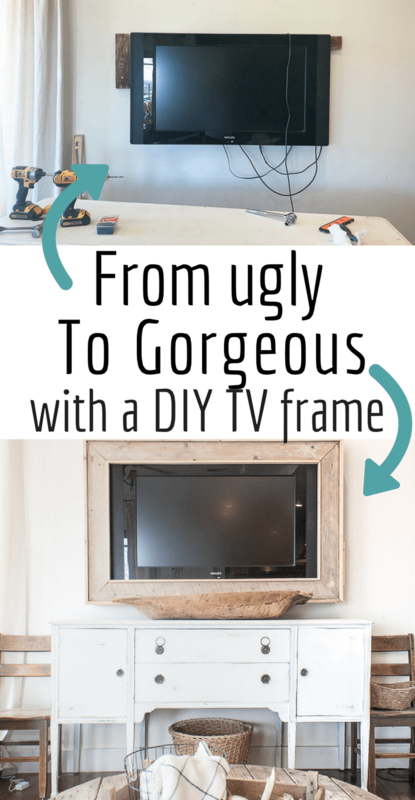 Make sure you share this with others and we can all have gorgeous televisions with an easy DIY TV frame! Have a great day! Thank you so much for stopping by! Looks really nice! It definitely takes the ugliness away of a tv. Such a clever idea! 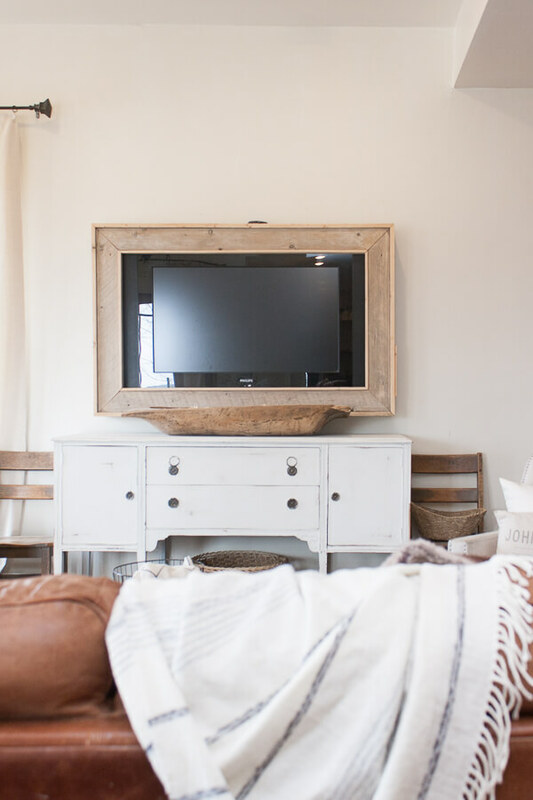 It does make the TV a little more attractive on the wall and would blend right in with a gallery wall. Thanks for sharing with us at Merry Monday. Hope to see you again next week. Oh my goodness… I don’t think I’ve ever wanted to hang my TV on my wall more than I do right now. This is a gorgeous frame design! Really speaks to the reclaimedwoodaholic tendencies I appear to own!